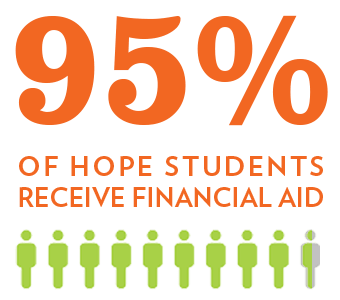 95% of Hope students receive financial aid. Before they are challenged to think with clarity and wisdom, before they are trained to bridge boundaries and before they are inspired to become agents of Hope, they are first scholarship recipients. Your entire gift to the Hope Fund supports student scholarships. Bring Hope’s mission to life for countless accomplished students, making a Hope education accessible for many who might otherwise deem it impossible. Create an agent of Hope and give today. Scholarships not only make attending Hope possible for many deserving students, they also help limit encumbering students with excessive loan debt (now up to almost $1.3 trillion nationally). The percentage of Hope graduates with debt and the average student loan debt per graduate are below the national average. In addition, repayment rates are well above national average. Our goal is to keep improving as we aim to be the best value among leading liberal arts colleges. We will do this, with your help, by providing an unsurpassed educational experience through faithful stewardship and development of resources. We want Hope graduates to focus their life's calling on today's most important issues, not just on a path influenced by economics alone. In order to become agents of Hope who live faithfully into their vocation, they need to be free to pursue professional interests, go on to graduate school, or serve others. Your gift to the Hope Fund helps make this possible. Our goal is to raise three million dollars for student scholarships by the end of June. Also, stay tuned for updates and students stories on this page as well as new perks at leadership giving levels.